As cloud computing becomes an increasingly important part of any IT organisations delivery model, assessing and selecting the right cloud provided also becomes one of the most strategic decisions that business leaders undertake. 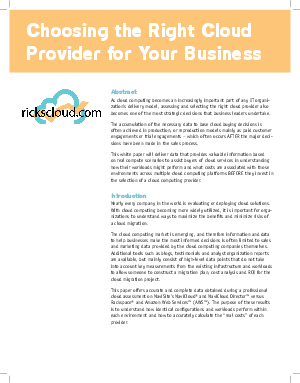 This whitepaper offers accurate and complete data obtained during a professional cloud assessment of NaviSite's NaviCloud and NaviCloud Director versus Rackspace and Amazon Web Services. The purpose of the results is to understand how identical configurations and workloads perform within each environment and how to accurately calculate the "real costs" of each provider.